Social Media vs Google Traffic – Which Is Better? Tiffany Lambert in a recent video talked about the best way to make money online (among other things). It got me thinking about this subject again and her slant on this was interesting and I agree with it. But before talking more about that I’d look at whether one method is the way to go. Dan Kennedy (copywriter) in many of his books warned against being reliant on just one of anything, that was whether it was one employee, supplier, customer, marketing method and so on. If I remember correctly, his view was that having just one of anything is bad as it leaves you at risk if that goes away. Also you can be effectively held to ransom too. If your single customer walks away you don’t have an income or if they threaten to leave they have a very strong negotiating position. So all in all just a bad idea as your business can go out of business at any time on the whim of the person that controls the “one” – whatever the one is. Back to Tiffany and she agreed with this from an internet marketing perspective too. Her view was that there isn’t just a single best way to make money – you need to have a number of ways that you make money is the best. Which is good advice but there is a proviso I have with this – which Tiffany does touch on in her video. In the video she mentions the perils of this giving the example of Squidoo making changes overnight that caused people to lose their income in a very short time (I talked about this when I reviewed Pintrender by Erica Stone). Yes, it makes sense to diversify. But you don’t want to be hopping from one shiny object to the next one without getting anywhere with it. It is too easy to fall into that trap of buying the next big thing. 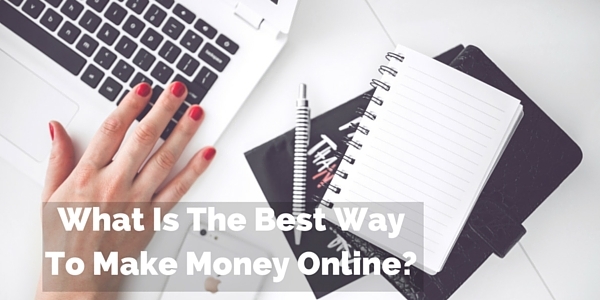 This isn’t the way to have multiple methods of making income online. It is more of a way of wasting money more than making money. When you’re learning it takes time to get good at something and I’ve from experience it doesn’t come from trying to do too many things at once or jumping from one thing to the next without giving the first thing a proper go. Marlon Sanders is a great guy that has been making money online and offline through marketing for a number of years who comes with lots of good stuff and has a great free weekly newsletter. Again, I can find the source of this but he said when getting started you need to concentrate on getting good at one thing at a time – get good at getting traffic from Google, then converting it, then move on Facebook Ads and converting that and so on. This is how you can go from having one method to multiple methods as well as not relying on one source of traffic or one customer and so on. It seems they all agree on one thing that you don’t want to be relying on just one way of making money online or one source of income. I’m at present moving along this track very slowly. For me I chose becoming an Amazon Affiliate using review sites. I’m making progress (see May Income report). But there are a couple of risks in this based on the risk of the one. ( Does 2 into 1 go). Just quickly – I am reliant on Amazon not changing it rules so I can’t earn commissions and Google not changing its algorithm in a way that makes my sites unable to rank to get visitors. This is the problem with relying on one income method and one income source and one traffic source. As Tiffany has reminded me again of the risks I’m going to make changes. I’m going to carry on adding more content but work on improving conversions following – Buried Treasure for identifying most popular posts, adding techniques from What Works Now and How To Write a Blog Post That Converts so I get better at that as I go. Next I need to look at getting traffic from other sources – such as social media. I also need to get better at getting email sign ups and then look after them – which will help diversify away from traffic. But enough of detailing that here. As it is going to be different for each person. To avoid that becoming just an overwhelm and not achieve anything I’m going to have a day each week where I set aside a set period of time to learn and implement new promotion methods as well as diversify the method building it out in the way that Marlon Sanders suggested. There isn’t a single best to make money online from what I can see as people can make money from various marketing methods and products. The choice comes down to what you like and what you are skilled in or can become skilled in. I do agree with Tiffany that best method to make money on the internet is to have multiple sources so that you aren’t totally reliant on one. The risk is high. But first its best to choose one method to get good at and concentrate on that – doing too much I feel is just a recipe for disaster. It’s not as exciting as chasing after the next big thing but it is more effective in the long run. Overnight success promised by sales letters unfortunately doesn’t normally happen without some hard work being put in. Once you’ve learned that method then you can start expanding into other methods – how long this all takes is up to you – how well you can create content 9or have it created), the method you choose, your marketing skills and so on – it depends on you – you might get it done fairly quick or you may get it done slowly – but whatever the time frame is it is important to keep at it. P.S. If you don’t have a method I recommend you check out Extreme Review by Erica Stone (Review here) to learn how to be a successful Amazon Affiliate using detailed reviews – it has helped me get to $1k a month – you can use it for other companies and products too. It will get you started and then you can move on after that.